Carson Wentz – “The Dakota Kid”? The great ones have nicknames. Peyton Manning was and forever will be “The Sheriff.” Brett Favre is “The Gunslinger.” And despite the drubbing the Pittsburgh Steelers took at the hands of the Philadelphia Eagles this past weekend, “Big Ben” Roethlisberger rightfully commands the respect of defenses across the National Football League. After only three games with the Eagles, it’s too early to tell if Carson is going to be worthy of mention in the same paragraph as those Hall of Fame (or soon to be) NFL quarterbacks. We’ll wait and see. But the early returns are looking really, really good. The North Dakota State University product has already set an NFL record for the most consecutive passing attempts by a rookie (99) in his first three games with no interceptions. He also earned National Football Conference offensive player of the week honors last week. He’s got everyone talking, jaw-dropping and wondering how in the name of the football gods the Cleveland Browns could have passed on a player who, so far, is writing the biggest story of the 2016-17 season with every pass. Oh, and let’s not forget about jersey sales. 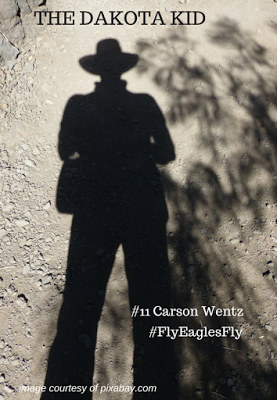 Carson’s #11 has been the NFL’s top-selling jersey for a few weeks now. They love him in Philly right now, and we’ll love him forever out here on the prairie. We’re also proud of his Bison teammates who are now at the next level: Andrew Bonnett, Eagles; John Crockett, Green Bay Packers; Kyle Emmanual, San Diego Chargers; Joe Haeg, Indianapolis Colts; Brock Jensen, Ottawa Redblacks; C.J. Smith, Eagles; Ryan Smith, Winnipeg Blue Bombers; Billy Turner, Miami Dolphins; and Marcus Williams, New York Jets. But right now, Carson’s our man. He’s our home-state boy, the NDSU triggerman, the hired gun from Bismarck who has helped lead his team to a 3-0 start. And given the bullets he’s firing out there – quick, sharp, on-the-money – an Old West nickname seems just about right. The Dakota Kid fits the no-fear, bring-it-on, devil-may-care confidence and joyfulness Carson has going for him. He’s a modern-day Billy the Kid with a football and sharp mind rather than a pair of six shooters. But Carson’s no outlaw. On the contrary, he’s a talented but humble guy who believes in faith, family and football. Hunting and fishing, too. As The Dakota Kid, Carson would forever be connected to all of us back home who watched every snap with anticipation as he led NDSU to two Football Championship Subdivision national titles. Sure, the nickname would bring South Dakota along for the ride, but what the heck. Right now Carson’s big enough for all 50 states, let alone the two Dakotas. There is a snack company of the same name, Dakota Kid Snacks in Menoken, N.D., too, but that roadblock could be cleared as fast as the ball shoots out of Carson’s hand to hit a receiver on a slant. It would be a co-branding bonanza, an endorsement deal made in heaven, or at least on the long road between Fargo and Philadelphia. Plus, The Dakota Kid would be a worthy addition to the ranks of quarterback nicknames: Joe “The Comeback Kid” Montana from the San Francisco 49ers; “The Bearded Pony,” a.k.a. Andrew Luck of the Colts; Drew “Cool Brees” of New Orleans Saints fame; New York Giant Eli “Easy E” Manning; Roger “The Dodger” Staubach of the Dallas Cowboys; and last, but certainly not least, Jets great “Broadway Joe” Namath. On the other hand, Carson isn’t the kind to draw attention to himself in any way but through his performance on the field. Self-aggrandizement isn’t his style. It would be nice, in other words, if people didn’t forget where he came from. We’re confident Carson never will. One day, Carson Wentz will be considered one of the greats, too, and have a nickname befitting his accomplishments. Right now – as he has said after each of his three NFL games – it’s about going 1-0 each week. Keep firing, Dakota Kid. Fly like an Eagle.